Researcher Lydia Anderson of the National Center for Family and Marriage Research at Bowling Green State University compared U.S. Census data from 1980 with the most recent American Community Survey data from 2015. Comparing 25- to 34-year-olds in 1980 with the same age group today, Anderson found that far fewer millennials are married, live away from their parents, have children of their own, or own their own houses than the baby boomers of the same age group the year Ronald Reagan was elected president. In 1980, for example, more than two-thirds (68 percent) of 25- to 34-year-olds were already married, whereas in 2015, just two in five millennials (41 percent) in the same age group were married. 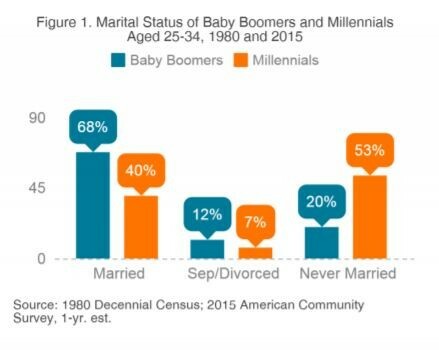 Only 20 percent of baby boomers of these ages had never been married, while more than half (53 percent) of millennials have never married. Anderson considers early baby boomers to be those U.S. citizens born between 1945 and 1955, while early millennials refers to those born between 1980 and 1990. Other common indicators of adulthood followed suit, Anderson found, such as what the study termed “residential independence,” or living away from one’s parents or grandparents. Home ownership follows a similar pattern. 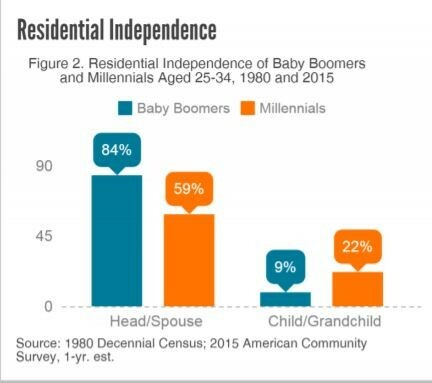 A majority (60 percent) of young adults in 1980 owned their own homes, while in 2015, less than half of young adults (43 percent) were homeowners. A final indicator of adulthood, which Anderson describes as “living with a biological child,” revealed a similar difference, although in this case it was somewhat less striking. In 1980, more than two-thirds (68 percent) of young adults aged 25-34 lived with their biological children, while the figure was just over half (55 percent) for adults of the same age in 2015.